Unfortunately, no one is immune from situations where sudden serious illness can lay in bed for a long time. In this case, it is important that for the patient has been provided the proper care. Of course, provide its in the home by the family members is not easy. Proper care fully capable to provide only a good clinic on care for immobile patients. Specially trained staff of the clinic will be able to be around all the time with the patient and, if necessary, to provide it with the necessary assistance and support. Care bedridden patients requires special attention by staff the clinic. In the care of bed-patients on the shoulders of nurses falls huge number of procedures - it should change the bedding of the patient, to ensure its hygiene, feeding the patient, to make the massage therapy, to carry out physical therapy, etc. Medical staff of clinic on care of bed patients greatly facilitates the life of not only the patient, but also his family, which can do not worry about the patient and be assured that for it properly cared. In addition, a good clinic staff is always ready to emotionally support the patient, talk to him, to keep him company. Creating a favorable psychological and emotional environment around the patient increases the chances of recovery, and accelerates the process of recovery. Bedridden patients are usually very acute worry his loneliness and inability to cater for self. Therefore in those cases where medical staff performs medical procedures considering the psychological state of the patient, the patient has a positive mood. Patients are easier to tolerate the suffering associated with the disease, actively participate in rehabilitation procedures. 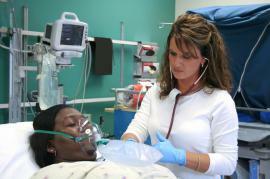 Professional nurses to this end receive special training, allowing them to always be polite and friendly to patients. Apart from worries about the emotional state of the patient, medical staff carefully monitors the physical condition. If any changes in the patient's condition should be immediate medical reaction, allowing quickly correct the condition and avoid possible unpleasant complications.